Sony Europe has recently announced the new Sony Cyber-shot S730 which is for the entry-level market. 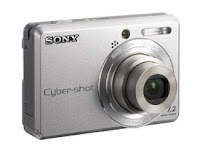 The Sony Cyber-shot S730 features 7.2 mega pixels effective resolution, 2.4 inch LCD screen, up to 1250 ISO, and 3x optical zoom. According to Sony's Press Release, the high sensitivity function of the Sony Cyber-shot S730 allows shooting at faster shutter speeds to reduce the risk of camera shake. Hmm, I don't know, in my experience, shooting at high levels of ISO usually result in crap images. Anyways, since the Sony Cyber-shot S730 is for the entry-level market, expect it to be cheap but since it's from Sony, not THAT cheap. Sony hasn't announced any pricing for the Cyber-shot S730, however, it is expected to be available in the European market in mid January 2008.